Castel Sant’Angelo, seen from the Ponte Sant’Angelo. It is difficult to imagine that this imposing cylindrical drum on a large square platform was once the tomb of the Roman Emperor Hadrianus (117-138), also known as Hadrian. The original decorations are all gone and the structure was turned into a formidable fortress long ago. It has also served as a place of refuge for popes and as a prison. Nowadays it is a museum. Around the year 130, the Roman emperor Hadrian began the construction of what was to become his mausoleum. It was composed of a gigantic square platform and a huge cylindrical drum. On the drum stood a tower which was topped by a four-wheel chariot or quadriga. The drum was decorated with statues, and trees were planted there as well. A year after his death in 138, the emperor’s remains were brought from Baiae to Rome and deposited there. The ashes of many of his successors were also interred in Hadrian’s mausoleum: the urns with the remains of Antoninus Pius (138-161), Lucius Verus (161-169), Marcus Aurelius (161-180), Commodus (180-192), Septimius Severus (193-211) and finally Caracalla (211-217) were all placed in the mausoleum, possibly in what is now the treasury room. 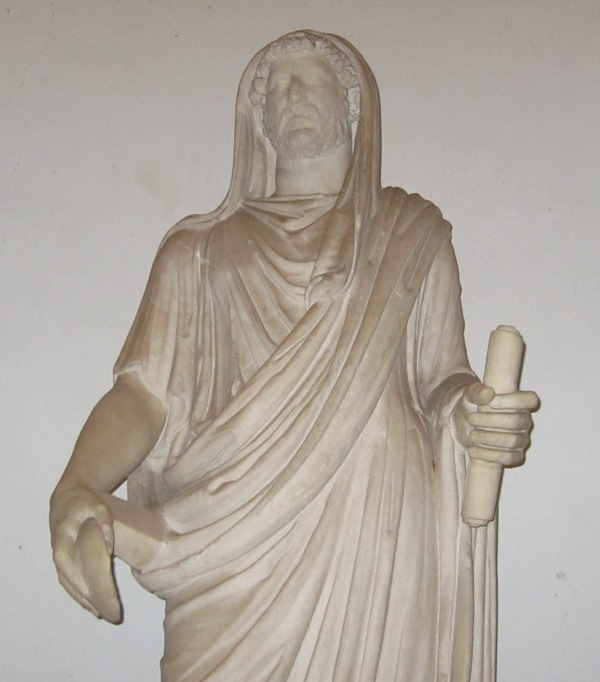 The emperor Hadrianus as pontifex maximus (Capitoline Museums, Rome). The mausoleum was turned into a fortress by the Western Roman emperor Honorius (395-423) in 401, just one year before the emperor moved the imperial court to Ravenna, which was considered to be more defensible because of the swamps surrounding it. Although part of the city’s defences, it was formally just outside Rome’s Aurelian Walls, which were constructed between 271 and 275. The reason for this is quite simple: Hadrian’s mausoleum was on the other side of the river. The tomb was built on the right bank of the Tiber (when facing downstream), while the walls followed the left bank and only crossed the Tiber in the district called Trans Tiberim, which later became Trastevere. The Ostrogoths were driven back after a hard fight and they were ultimately forced to break off the siege. Drum of the Castel Sant’Angelo. In 590, a terrible plague was claiming many lives in Rome. Pope Gregorius the Great led a penitentiary procession through the city (see Rome: San Gregorio Magno). When the procession was near Hadrian’s mausoleum, the pope saw the archangel Michael standing atop the structure, sheathing his sword and thus indicating that the plague was over. Hadrian’s mausoleum now became known as the Castel Sant’Angelo. The bridge across the Tiber leading to the Castel – the Pons Aelius, also commissioned by Hadrian – was henceforth called the Ponte Sant’Angelo. Pope Gregorius was reportedly just crossing the bridge at the head of the procession, on his way back to Saint Peter’s Basilica, when he saw the archangel with his sword. The square platform of the Castel Sant’Angelo measures about 86 metres on all sides. The cylindrical drum has a diameter of some 64 metres, while the structure is at least 50 metres high. It is surrounded by four bastions named after the four Evangelists. 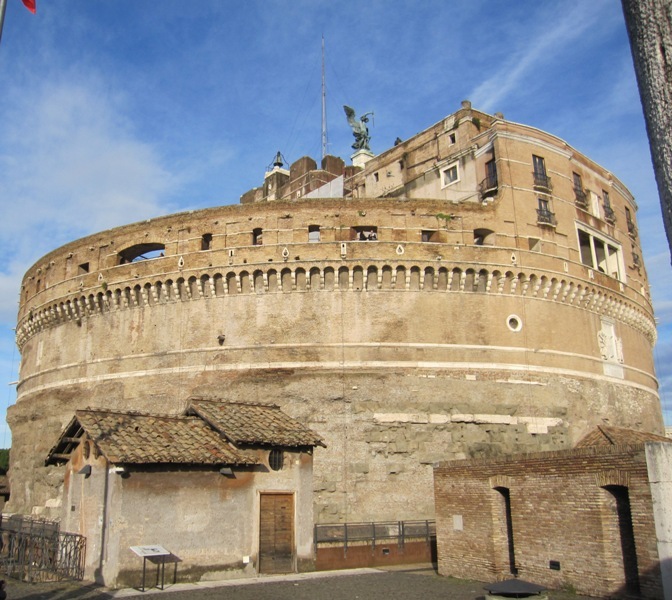 Obviously such a fortress could not be taken easily, and later popes strengthened it and took refuge here if they were under pressure from foreign enemies or from the fickle people of Rome (which seems to have been the case quite a lot; it was not always the people’s fault). During the pontificate of Pope Nicholas III (1277-1280), a covered corridor was constructed which connected Saint Peter’s Basilica to the Castel Sant’Angelo. The pope now had a more convenient escape route, the Passetto. Pope Clemens VII (1523-1534) fled to the Castel Sant’Angelo during the Sacco di Roma of 1527, when thousands of mutinous Landsknechts in Charles V’s army entered the city and pillaged it (see Rome: Villa Farnesina). The Passetto ends at the Bastion of Saint Mark. The last part has a drawbridge, which can be raised so that the defenders are safe. Pope Clemens was besieged inside the Castel for about a month before surrendering and paying a sizeable ransom. Living conditions inside the fortress were probably not very comfortable, so his successor Pope Paulus III (1534-1549) decided to do something about this. 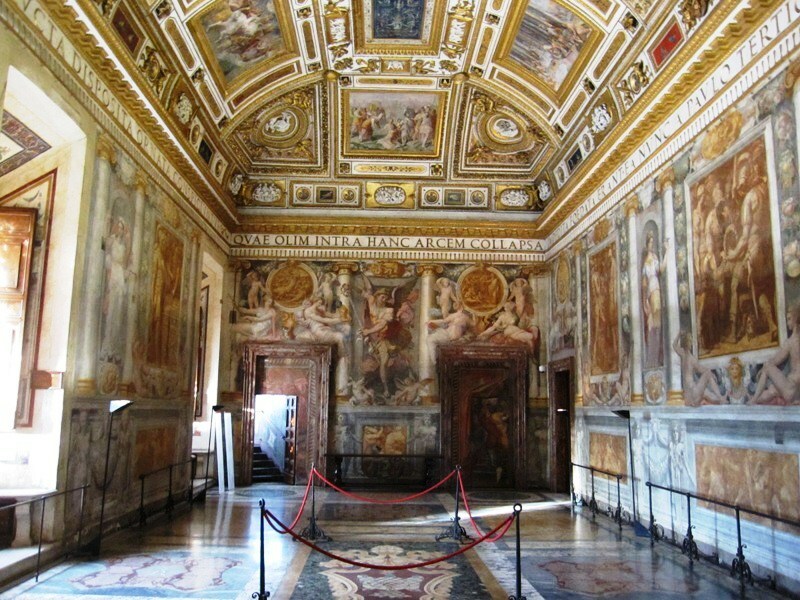 Many of the rooms inside the Castel were improved and decorated with beautiful frescoes. Much of the work was executed by Perino del Vaga (1501-1547). The most beautiful room is undoubtedly the Sala Paolina, with its lavishly decorated walls and ceiling. 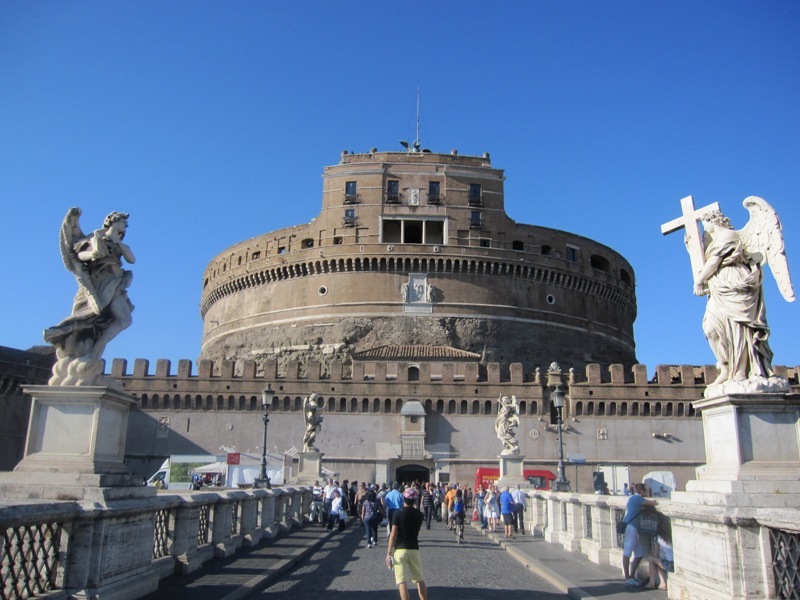 The Castel Sant’Angelo was also used as a prison by the popes. Beatrice Cenci – falsely charged with the murder of her father – was a prisoner here prior to her execution in 1599 (see Rome: San Pietro in Montorio). The monk Giordano Bruno, burned at the stake for heresy in 1600, was also imprisoned in the Castel’s dungeons, and so was the famous Florentine sculptor and goldsmith Benvenuto Cellini (1500-1571), who was charged with embezzlement. Some ten years before he was arrested and thrown into prison, Cellini – also a soldier – had helped defend the city of Rome during the sack by Charles V’s troops (see above). He obviously fought bravely, but there can be some doubt about the claim that it was Cellini who fired the shot that killed the Imperial commander, Charles III, Duke of Bourbon. 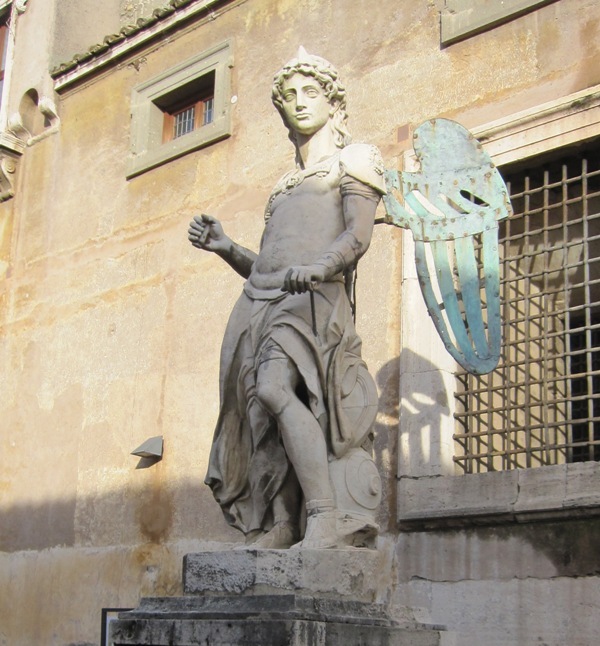 Michael the archangel is omnipresent in the Castel Sant’Angelo. He can for instance be seen on the walls of the Sala Paolina, in one of the interior courtyards and atop the building. The statue in the courtyard was made by Raffaello da Montelupo (ca. 1505-1566) in the 1530s or 1540s. 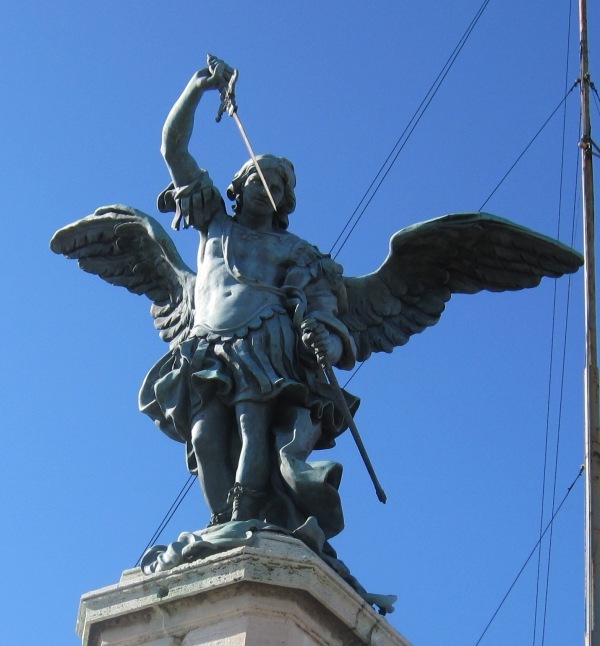 Da Montelupo’s angel was originally the angel topping the Castel Sant’Angelo, but it was replaced in 1752 with a bronze angel by Flemish sculptor Pieter Antoon Verschaffelt (1710-1793). The current angel is best admired from the observation terrace of the highest part of the drum. This terrace also offers a panoramic view of Rome, although it is not as beautiful and impressive as the view from the lantern of the dome of Saint Peter’s Basilica, which is some 80 metres higher. 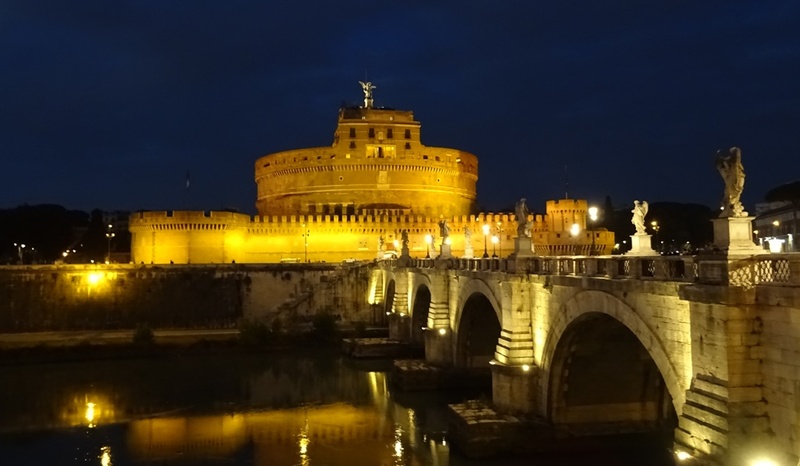 The Castel Sant’Angelo by night. Luc Verhuyck, SPQR. Anekdotische reisgids voor Rome, p. 63-67. Update 13 January 2017: pictures have been updated.